This first compilation on Hypnos brings together 19 of today's most talented and visionary artists, including Vidna Obmana, A Produce, Jeff Greinke, Ron Boots, Jeff Pearce and many others. All 19 tracks are exclusive. Vidna Obmana "Approaching the Glaze"
Ruben Garcia and A Produce "Rhyolite"
Thomas Ronkin "The Gates of Sleep"
Saul Stokes "(Never Ending) Halogen Sparrows"
Ron Boots "Among the Stars"
David Tollefson "Exqoor (Illusive mix)"
Larry Kucharz "1976 no. 5a"
Meg Bowles "Adrift in the Arms of Morpheus"
Exit "Sleep 1 (Lucid Mix)"
Alpha Wave Movement "Subterranean (Unknown Depth Mix)"
Jeff Pearce "The Sacred Descent"
"Top 20 of 1998 (#1)." "Top 20 of 1998 (#5)." "I know it's early in the year, but no way does this fail to make my 1998 top 10." "Best Multi-Disc release of 1998." "...a who's-who of the experimental/electronic underground. Vidna Obmana, Ruben Garcia, A Produce, Alpha Wave Movement, Robert Scott Thompson, Richard Bone, Larry Kucharz and the usual Hypnos suspects are on hand interpreting atmospheres, visiting unknown quadrants, jacknifing across the cosmos, reveling in stasis and acceding to entropy. Ambience is the defining credo on The Other World, though some twists and turns are taken by Stokes, Greinke and Richard Bone (on his "Via Mycropia"), to name a few. Ultimately, this is a sterling collection hosting some of the genre's emerging and enduring players." "Mike Griffin's Hypnos label deserves a special mention this year, for its consistently high-quality releases. 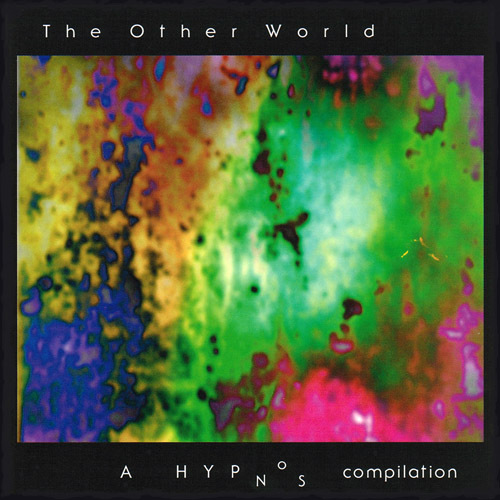 THE OTHER WORLD is perhaps one of the finest various-artist compilations of space-music ever, and while not all of the artists are household names, the music is first-rate, perfectly sequenced, and beautifully packaged."